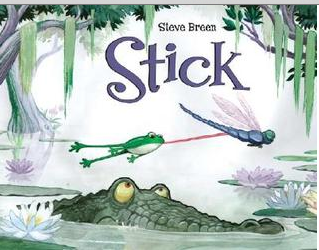 The story I'm highlighting today is one of my absolute favorites: "Stick" by Steve Breen. Here's the review from Amazon : Stick is a young frog with a very long tongue and a hunger for adventure. One day he zaps a dragonfly, his tongue sticks to the insect, and he's carried off along the Mississippi River and into New Orleans. After being dropped onto a horse's nose and flicked back into the air, Stick attaches his tongue to a balloon bouquet for a scenic city tour. Drifting back to the country, he has several more airborne escapades before jumping onto a seagull's beak for a ride above the Gulf of Mexico. Finally dropped onto a dock, he's alone and scared. He asks a heron for help and the bird flies him home to his mother. Hungry, he zaps a firefly instead of a mosquito and takes on the bug's glow (Oops). This book is absolutely fabulous for using in therapy for several reasons. First, the illustrations are wonderful and engaging. Although there is a lot going on in each page, it isn't overcrowded. I love that you could spend 30 minutes just talking about the details in few pages, or you could read it cover to cover in ten minutes without losing the storyline. My second reason is related to the previous - there is plenty of movement and action going on! An underdeveloped understanding of verb tense and agreement is a huge problem for many of our kids. Because the story is action-packed, there are plenty of opportunities to target verbs. The third reason I love this book is because there are few words on each pages. 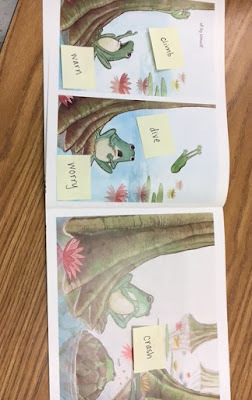 While this might seem counterintuitive for building language, I've found that the best books to use with language impaired kids are ones that allow for the students to build the story rather than stick to the words on the page. It can be overwhelming for them to see a bunch of words on the page and difficult to get spontaneous output if they think we are "reading" the book in the traditional sense. Tx target: Use of correct verb tense and agreement, vocabulary diversity: Using post-it notes, discuss the actions on each page. Generate good descriptive verbs for each page and write on a sticky note (e.g., soar, leap, hop). Then, students take turns telling the story using the words on the notes. Tx target: Use of prepositional phrases: Again, use post-it notes to highlight positions of the frog and other objects (e.g., over, under, across, between). Add picture support if needed - I love "Preposition Pete" from LessonPix. Then, students take turns describing location using the previously identified words. Tx target: Generate predictions and inferences based on pictures: Go through the book one page at a time, making predictions about what will happen next and inferences about how the characters are feeling. Discuss the difference between a prediction and an inference (a prediction is confirmed later in the story, whereas an inference is a guess that might not be confirmed). Assessment: Narrative language sampling: Instruct students to tell the story "like an author would." Record the sample and analyze for grammaticality, sentence type, vocabulary, etc. See Tatyana Elleseff's gues post on Figuratively Speeching for tips. Hope you enjoy using this book as much as I do!